OttLite TrueColor Replacement Bulb - OTTLITE-OttLite Replacement Bulb. 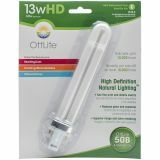 This package contains one 13W Type E light bulb. Imported.